You are currently browsing the tag archive for the ‘Research’ tag. 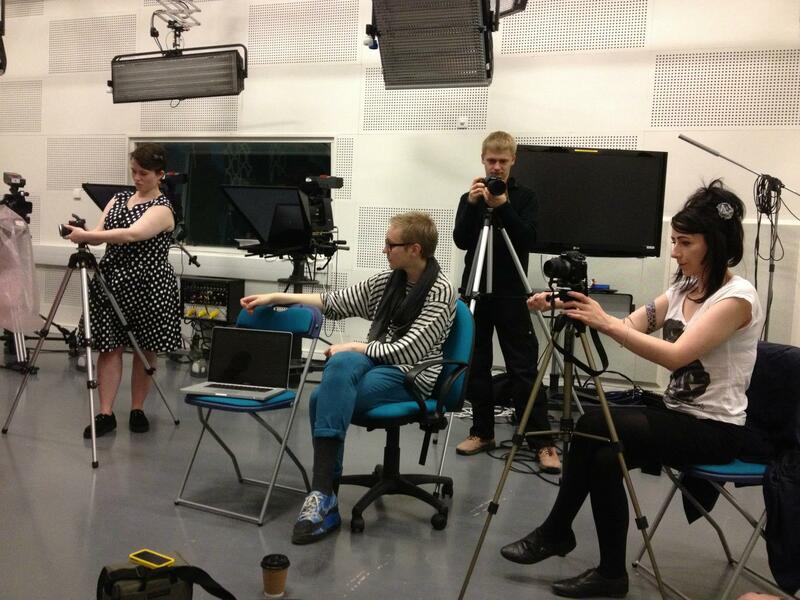 This week Contemporary Screen Acting students at the University of The West of Scotland took part in the launch of a unique new creative Screenwriting project. “Studio Lab” is based in the UWS new 80 million pound Ayr campus where students have access to two full HD state of the art TV Studios. As part of their final year Research Project, Ba (Hons) Contemporary Screen Acting students are creating an hour long drama which will be recorded live in December at UWS studio 1 .However, what makes this cross-over project unique is that students from other UWS Programmes are being integrated from the beginning into what will be a 12 week process. Every Wednesday afternoon, Film Making & Screenwriting students will help to develop the narrative, Broadcast Production students will be in charge of the recording and vision mixing it, Commercial Music students will supply the soundtrack and so on. The whole enterprise will come to a climax on Dec 5th when the entire team , directed by “Chewing The Fat and “Still Game” director Michael Hines, will record the drama “live” in the TV Studio. As leader of the Programme, I am supposedly in creative charge of the whole process but if truth be told it is the students who are leading the way. The first step was taken in our main Studio 1 yesterday when the actors took started their initial improvisation .They are charged with the task of creating three dimensional characters who will eventually go on to improvise a script which will then be rehearsed and acted out in the drama. 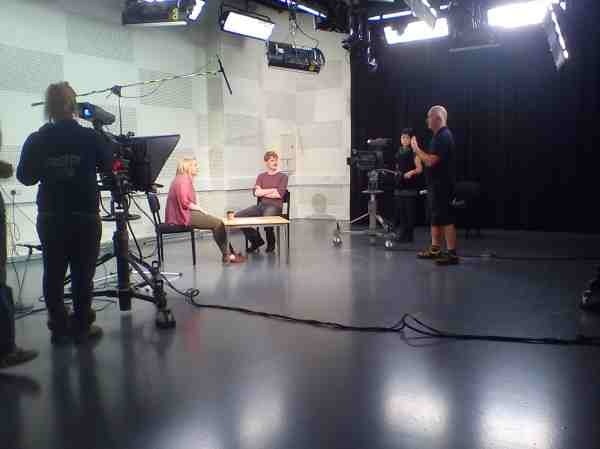 While the Screen Acting students took part in a tense “hot seat” improv, Film Makers recorded their every move on two HD cameras. By next week we will have a digitised and edited Quicktime of the process created by the Film Makers , and it will be viewed by all participants . They will then discuss the characterisation , decide what to use and what to drop, and then move on to recording the next stage of the improvisation, and so on. 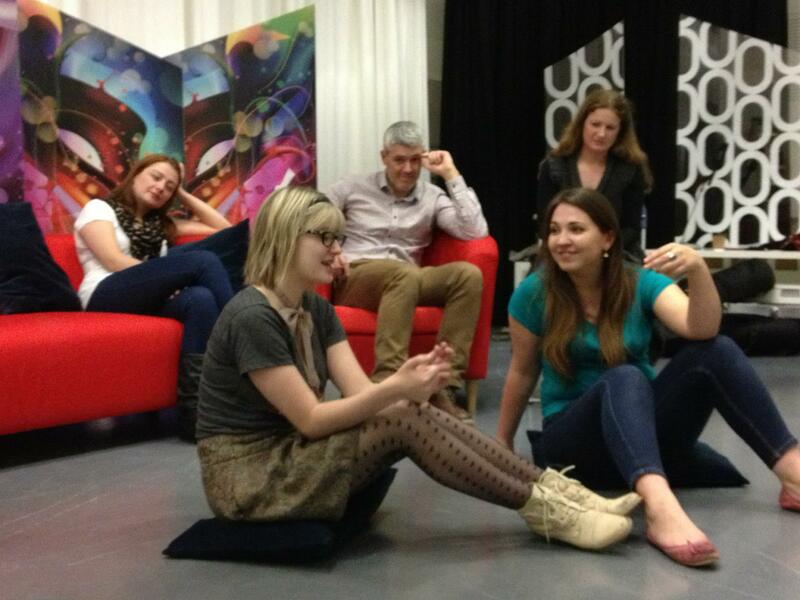 A script will evolve over the first 6 weeks of this process, and by week 11, a fully fledged unique studio drama will have emerged to be recorded in the final week. Students at the first session described the process as being “an intense experience”……”as soon as I was under the lights, all the stuff I had planned on using disappeared, and I found I was really being the character”. The whole idea of the “Studio Lab” process is to create an exciting collaborative environment where we mimic the professional Creative Industries where teams of different disciplines get together to create the final product. If the first week is anything to go by, it will reap creative rewards. We don’t know if the final programme will be a comedy, a drama, or a mixture of the two genres, but it will certainly be a unique experience for all concerned.